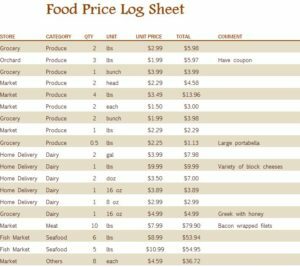 Only for the savviest of shoppers, the free Food Price Log Sheet can help you find the stores with the best prices and keep coming back for those particular items for the maximum amount of savings. Consider this free template as an organizational space in which to track the prices for the items you buy the most and ensure you always get the best deals. Whether you want to save money on your favorite brand of yogurt or sip from the sweet coffee of savings, you can do so with this free template. To learn how to download and use this document, you can just follow the list of instructions provided below. Click the link at the bottom of the page to download the free template file. The next step will be to start with the date you went shopping and found a good deal on one of your favorite items. You will list the item you bought, the store name, the category of the food type (you can use the drop-down menus provided), the quantity, the units, and so on. After just a few shopping trips, you will have the ultimate list of shopping items and where to find the best prices. You will see that over to the right of the page, the template automatically calculates all the different categories to give you the amount you’ll spend on your groceries from month to month. The goal of this template is to keep trying to find the best deals and get that total lower and lower. The absolute total for your entire shopping list will be displayed at the very bottom of the table. You can see how easy it will be to shop and save this year with this free template at your side!